Access, Simplicity, Cleanness, Friendliness, and helpful: are the staff. The facility is always clean and well-maintained. I like the raised lip on the storage floor, which traps mice. Found 2 dead in 2 yrs, Never reached my clothes/things. The Maintenance staff are very helpful! Good location! Quiet when I want to search the storage. 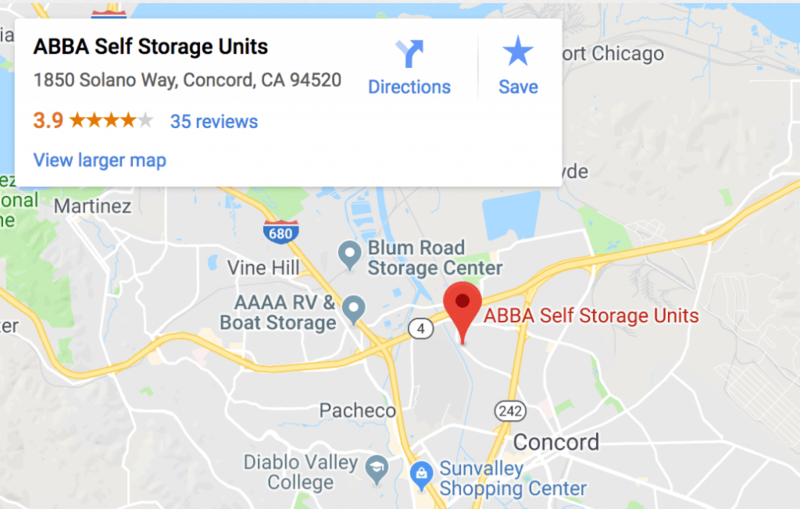 cant say enough great things about ABBA storage. ive rented there for over 3 years. the facility is safe, clean, well maintained and the climant control is always on in my building. i never had a single issue with them. in fact, when ive had issues arise from my end (such as loosing a key lock, changing units, changes to auto payments, needing supplies or equipment, you name it ive done it), they have always helped me out with a focus on personal service. ive used every other major company for personal storage over the years traveling. with the others, ive always felt like another number to collect money from. but not so with ABBA storage, everyone there takes the time to listen and help. i am a loyal customer based on their service. i also wanted to give a special thanks to Derrick, who always has the answers i need and brightens my day when im on the grounds and makes me feel welcome instead of doing a chore. thank you sir! and thank you ABBA! Simply outstanding. From the location, to the staff to the cleanliness and organization of everything. It makes you want to buy something you can't keep at home just so you can do business with them.